Which Gout Treatments for Pain Control? Which Gout Treatments for Pain Control is part of the 4th step in your gout treatment plan. Now, you choose the specific treatments that you will use to control gout pain. In Step 2, you decided that Acute Gout Treatment is most important to you, at the moment. In the previous step, you chose Medical or Natural Gout Treatment. If you haven’t made those choices yet, please go back to Starting Gout Treatment Guidelines. 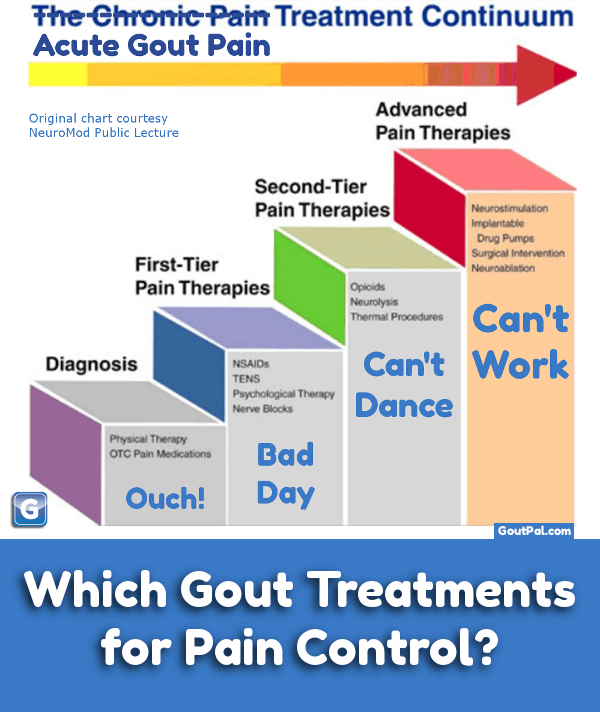 In this step, we first need to decide if we want gout treatments for pain control to be preventative, or as required. Gout Treatments for Pain Control: Preventative or As Required? Preventative gout treatment is good for the first weeks or months of uric acid lowering treatment. If you are not actively trying to control uric acid, you should not take gout treatments for pain control on an everyday basis. Your doctor will advise you how long it is safe to take preventative gout pain medication. If you prefer to take gout pain medication as required, there is one important point to be aware of. The quicker you act, the quicker your gout pain will resolve. The exact prescription, or herbal gout medicine ingredients will vary according to the severity of your pain. In your own gout treatment plan, your health adviser will recommend appropriate doses of your preferred medications. If you do not have a personal gout treatment plan with your health adviser, you can get one in my gout forum. Which Gout Treatments for Pain Control are strong enough for You? Your health adviser should recommend a combination that is safe for your medical history and any other medications. You can also get help in the gout forum. Leave Which Gout Treatments for Pain Control to browse my Gout Treatment Guidelines. TL;DR - Which Gout Treatments for Pain Control?